I absolutely adore rugelach and can’t believe that it took me so long to make them myself. Ironically, I made them the same day that I made the Chocolate Babka – it was a Jewish baking extravaganza! 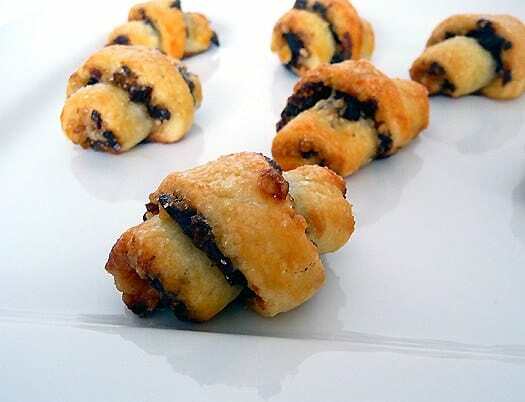 The history of rugelach, much like babka, is that they were first brought to America by Eastern European immigrants and are popular during Jewish holidays. 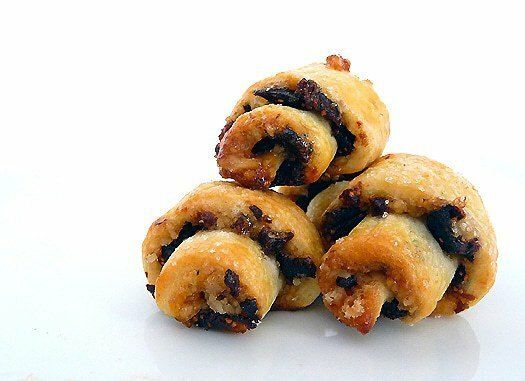 Rugelach is made up of a wonderfully tender cream cheese dough and is filled with dried fruit, chocolate, or nuts or a combination of all three. Most versions include raisins which is what I filled half of mine with, and the other half I filled with dried figs. I just love figs and look for any excuse to use them! 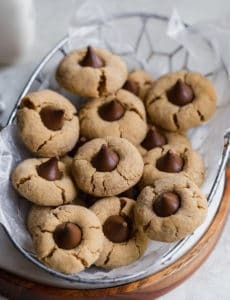 These would also be fabulous brushed with raspberry jam and filled with bittersweet chocolate. Yum! While these take some time and a few extra steps to put together they are not at all complicated; and that flaky pastry dough is well worth the effort! 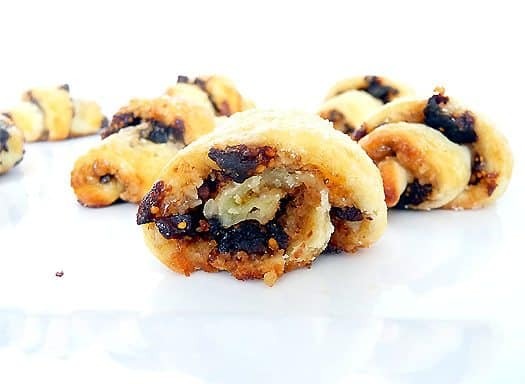 Have you had rugelach before? If so, what is your favorite flavor combination? 1. 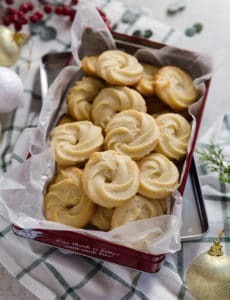 In the bowl of an electric mixer fitted with the paddle attachment, beat the butter and cream cheese on medium speed until light and fluffy, 3 to 4 minutes, scraping down the sides of the bowl. Add ½ cup granulated sugar and ¼ teaspoon salt; beat until combined and fluffy, about 3 minutes. Add the egg yolks, one at a time, beating to combine after each. With the mixer on low speed, beat in flour to combine. Mix in vanilla. 2. Turn out the dough onto a lightly floured work surface. Divide into three equal pieces, and shape into flattened disks; wrap each in plastic. Refrigerate at least 1 hour or overnight. 3. Preheat the oven to 325°F, with racks in the upper and lower thirds. Line three baking sheets with parchment paper; set aside. In food processor, pulse together the walnuts, remaining ¼ cup granulated sugar, the cinnamon, and pinch of salt until finely ground; set aside. On a lightly floured work surface, roll out one disk of dough into a 10-inch round about ¼ inch thick. Brush the top evenly with melted jelly. Sprinkle with a third of the walnut mixture and a third of the currants. Using the rolling pin, gently roll over the round to press the filling into the dough. 4. Using a pizza cutter or sharp knife, cut the round into 16 equal wedges. Beginning with the outside edge of each wedge, roll up to enclose filling. Place about 1 inch apart on the prepared baking sheets. Repeat with remaining dough and filling ingredients. Lightly beat the whole egg; brush over tops, and sprinkle with sanding sugar. 5. 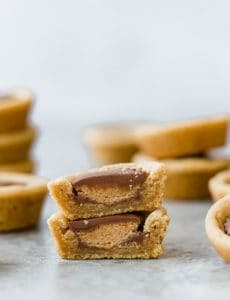 Bake two sheets, rotating halfway through, until the cookies are golden brown, 20 to 25 minutes. Transfer to a wire rack to cool completely. Repeat with remaining baking sheet. 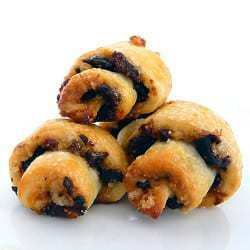 Rugelach can be kept in an airtight container at room temperature for up to 4 days. Hi! I love rugelach, but I am partial to a dough that does not contain cream cheese. I have not made it the past few years, because I find it labor intensive. This year though, I am going to wimp out a bit and roll my dough into a rectangle. Then I will roll it jelly roll style and cut in squarish shapes. Rolling those crescents and trying to get them all the same size was time consuming and drove a perfectionist, like me, insane! My fave flavor combo is Nutella and walnuts. Happy Holidays! Do you have a recipe for a pumpkin filling without nuts for Rugelach ? Hi Martha, Unfortunately I don’t have a pumpkin rugelach recipe. Michelle, can I make them a few days before and freeze them before baking? Hi Lisa, Yes, you just may need to add a couple of minutes to the baking time.